The skin of a mature luffa just peels right off. The other morning, Sadie the farm manager was peeling the skin off a long, green, slightly lobed vegetable that looked like a cross between a cucumber and a pumpkin. Underneath the skin was a tangled mass of fibers, and it didn’t look edible at all. “You can try to eat it, but you won’t get very far,” farmer Margie commented. I was looking at a freshly picked mature luffa (or loofah). 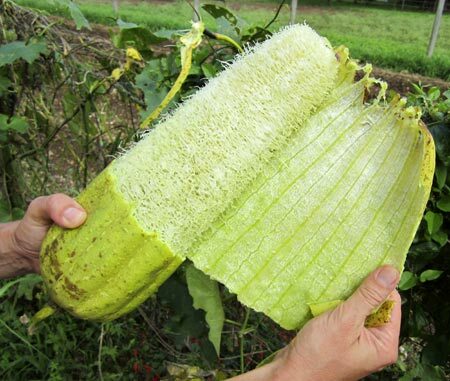 Sadie shook and squeezed out large, pumpkin-like seeds lurking inside channels that ran the length of the luffa. They will be dried and saved for planting later. 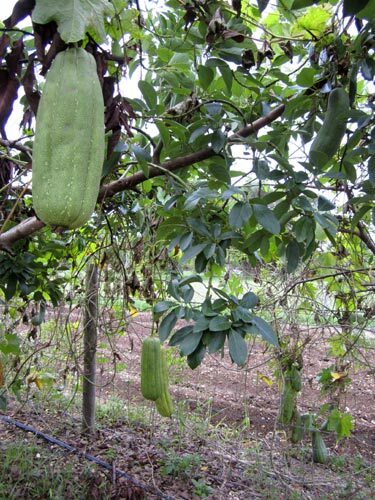 Luffa vine climbed from the wire fence (background) up into an avocado tree. Loofahs are a member of the squash family, and grow on a long, slender vine that will take over any fence or support you give it. The gourd itself grows to about two feet in length. When they are small, they feel spongy when you squeeze them, and are said to be edible. As they grow, they feel quite heavy and solid. The older they get, the more fibrous they become. Peeled luffas soak in the deep sink. They are weighed down with a concrete block. Inside is a “vegetably slimy flesh on the fibers,” Sadie explained, and the only way to get it off is to let it soak. Peeled luffas sit covered in water for a couple of days, held down with a weight to keep them from floating to the top. The slimy flesh ferments off (and I suggest you do this in a well ventilated place because they stink). 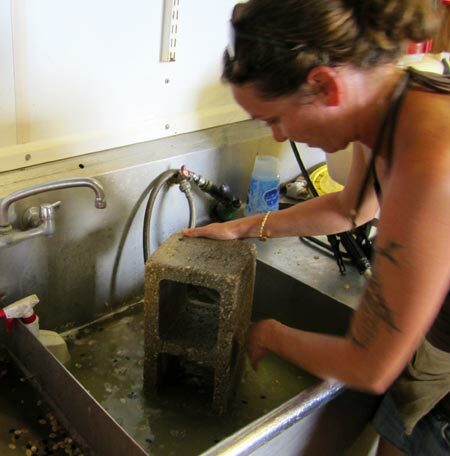 Then the fibrous luffa is rinsed, soaked in a mild beach solution (also weighted down), rinsed, and air dried. The end result is a long, pale mass of tangled fibers that’s the vegetable equivalent of a scouring pad. Ones with coarser fibers work well to scrub a non-stick skillet or barbecue grill, and the ones with thinner, softer fibers are great for the bath. Rise your luffa thoroughly after use and let it air dry. It will last a long time. 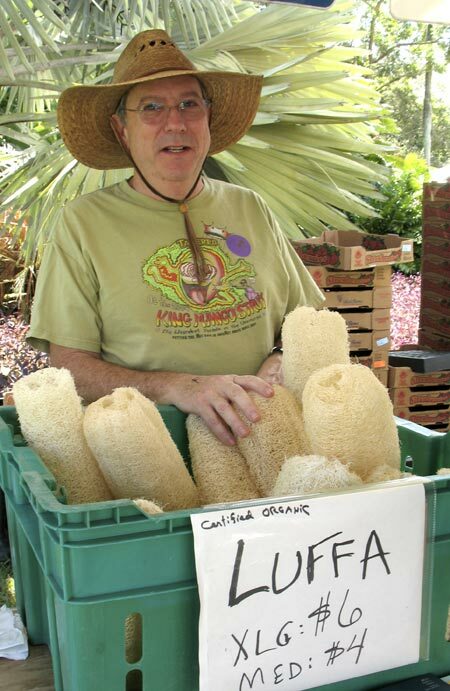 Look for whole, dried luffas at the Bee Heaven Farm tent, at the Pinecrest Gardens Farmers Market, starting on Sunday, Nov. 20th. Looking forward to a great Farmers Market and the Bee Heaven tent.